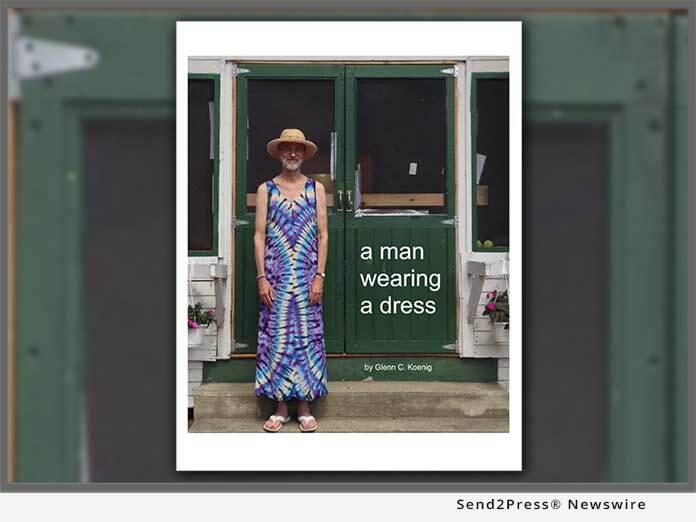 ARLINGTON, Mass., Oct 30, 2017 (SEND2PRESS NEWSWIRE) -- ARLINGTON, Mass., Oct. 30, 2017 (SEND2PRESS NEWSWIRE) -- After three years of work, first time author Glenn Koenig is celebrating the publication of his first book, "A Man Wearing a Dress" (ISBN: 978-0998583303) now available from publisher Message Rain. He plans to host a book release party on Tuesday, Nov. 14 from 7 to 9 p.m., at the Robbins Library, 700 Mass. Ave., in Arlington center. At the event, Koenig will sign copies of the book, read excerpts, and answer questions. The event is free of charge and the public is invited. Copies of the book will be available for purchase, and refreshments will be served. The book is primarily a memoir, but also includes an important section regarding the author's optimism in today's uncertain times. "Looking at the big picture, I am very positive about where we're headed, even if it doesn't seem that way right now," Koenig says. "I think it's natural for people to feel a lot of anxiety these days, but I'm convinced that we're going to see our way through it." He has a strong belief that we make more progress through collaboration and mutual support than we do by blaming others. Koenig is asking anyone interested in attending the event to please obtain a ticket by going to his web site - www.messagerain.com - selecting the "Appearances & Events" menu, and using the "Get Tickets" button to register. The tickets are free, but he would like to get a head count in order to plan. Registered ticket holders will receive additional information regarding transportation and parking. For those unable to attend, the book is available at bookstores everywhere, as well as from online sellers. A resident of Arlington for over 40 years, authoring a book represents a new stage in Koenig's life. Previously, his career included work as a software engineer, a video producer, and a technical writer. He has also devoted significant time to volunteering in Arlington, including sixteen years as an elected Town Meeting Member, serving on the Vision 2020 steering committee, and as the first president of ACMI, Arlington's Community Media studio. "Some early reviews are coming in, and they're very positive, so I'm looking forward to a good turn out," says Koenig. To learn more, visit: http://www.messagerain.com/books. The book is available now at all major book sellers, Amazon, and select local bookstores in Massachusetts (see website for more information). The author can be followed on Twitter @gckoenig and on Facebook under Message Rain. Editorial note: the title case for the book is actually "a man wearing a dress" however is used in traditional initial caps for purposes of the news announcement.